“Political conflicts lead to confrontation and disunity, including among people sharing the same faith. Ukraine’s existence as an integral state is under threat. These events are rooted in the internal political crisis, and in political forces’ inability to tackle problems in a nonviolent way. Our flock is made of people of various political views and convictions, including those who stand at the opposite sides of the barricades. 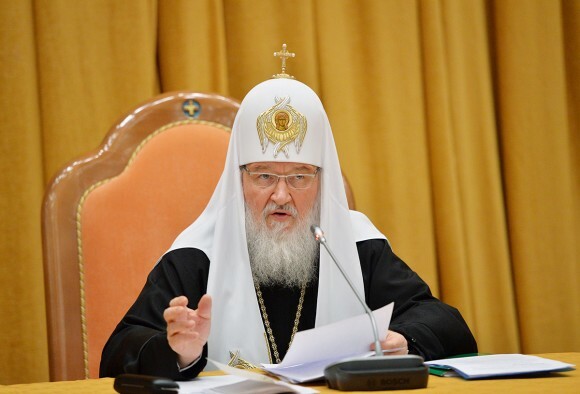 The Church does not side with any party in the political struggle,” the patriarch said in an appeal to Metropolitan Onufry of Chernovtsy and Bukovina, the locum tenens for the Metropolitan Diocese of Kiev, and to archpriests, priests and the faithful children of the Ukrainian Orthodox Church in connection with the situation in Ukraine. “May God stop every arm raised with the intension to cause pain and suffering, and let God bless all those who advocate peace. May our All-Merciful Father stop the brothers fighting against each other, as well as violence and the desecration of the holy shrines. May no more blood be shed on the Ukrainian soil. Let us say our passionate and common prayer for this.” Patriarch Kirill said.